A Girl and Her eBooks: Merry Christmas Romance by Helen Scott Taylor - $0.99 Goodie! Merry Christmas Romance by Helen Scott Taylor - $0.99 Goodie! Sweet, heartwarming romance to give you that warm, fuzzy feeling at Christmas. When a tree falls on Rachel's house in a storm, the person who rescues her is Ian, the same man who rejected her declaration of love when she was eighteen. She has banished him from her thoughts for eight years, but all her feelings rush back as he plays the white knight and takes Rachel and her son into his home. The young man she once knew is now a wealthy, successful business owner, and more gorgeous than ever. Life has left them both bruised, but can they put the past behind them and start again? After he loses his wife, army surgeon Colonel Sean Fabian protects his damaged heart by cutting women out of his life. He dedicates himself to his career and being a great dad to his twin babies. When he asks army nurse Kelly Grace to play nanny to his children over Christmas, he realizes how much he misses having a beautiful woman in his life and in his arms. Caring for Sean's adorable twin babies is Kelly's dream come true. She falls in love with the sweet little girls and their daddy, but she's hiding a devastating event from the past. If she can't trust Sean with her secret, how can she ever expect him to trust her with his bruised heart? Penny fell in love with her sister's boyfriend the first time she laid eyes on him. Eighteen years later,her feelings haven't changed, but his marriage to her sister is over. Can she risk their friendship for love? 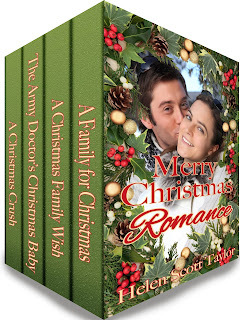 Excerpt From The Army Doctor's Christmas Baby, #3 in the boxed set. Intro: Kelly agreed to dress as a bunny girl to sing happy birthday to an army surgeon. She's just arrived at the party and sees him for the first time. Curious to meet this brilliant army doctor, she fixed her gaze on Col. Sean Fabian. As he met her gaze she stumbled, nearly dropping the cake, the familiar words to the song dying in her mouth. Oh my goodness! The man was stunning, his eyes an extraordinary aquamarine color, like nothing she'd ever seen before. Alice's strange comment about not being put off by his looks suddenly made sense. He was so good-looking, it was intimidating. Kelly's cheeks heated with embarrassment—if only she'd taken a moment to check her makeup in the restroom when she arrived. Somehow she closed the distance between them and held out the cake. A grin kicked up the corners of his mouth. He gave her a crooked smile, dimples appearing in his cheeks, those incredible eyes sparkling with pleasure. Her stomach flipped and she struggled to draw in air. No way could she kiss this man in front of everyone. No way. "Thank you very much. This looks delicious." His gaze flicked from the cake to her face as he took the chocolate confection and placed it on the bar. "Kiss, kiss," Cameron chanted and some of the others joined in. Although it would be embarrassing to kiss Sean, it would be more embarrassing to refuse. She really had no choice. Obviously a gentleman, he waited for her to make the first move.